Every time I go to Spain, which is quite frequently, I always get a paella. I must say the best paella I have tried has been in Valencia. To that end, the last trip which was a few months ago, I went to the massive food market there and picked up a huge sack of paella seasoning with the mission to make my own simple and easy paella. This recipe is easy, quick and full of flavour, I hope you love it! 1. Finely chop the red onion and garlic. Heat a pan (a large flat pan if you have one) add the 1tbsp of rapeseed oil, once warm add the onions and garlic on a medium heat. 2. While the onion and garlic are cooking, chop up the chorizo and when the onions have gone translucent add the chorizo and 2 tsp of the paella seasoning. Stir well. 3. Once the chorizo have cooked for a few minutes and are well combined with the onion, garlic and seasoning, add the tin of organic chopped tomatoes, combine well and let the mixture simmer for a few minutes. 4. Add the paella rice, stir well and add stock until the rice is covered but not swamped. The rice within a few minutes will absorb all the liquid keep adding stock until the rice is fully cooked and soft. After the second addition of stock add another 2 tsp of paella seasoning and season the rice to your taste. Allow the rice to cook for 10 -15 minutes. 5. 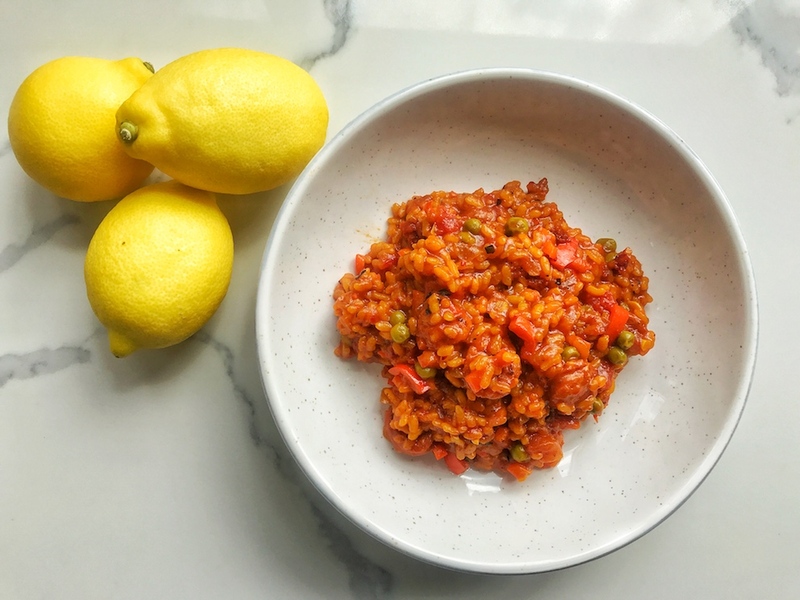 Once the rice softened add the peas, chopped up peppers and the juice of one whole lemon (you can add less if you are not too keen on the lemony taste), allow everything to cook for another 5-8 minutes. The paella should now be ready!¡Buen apetito!